Party Time, All the Time! That are the new books coming out so I am signing off. Cave Closes and Let’s Dance! There also a new pin added to the island, it is a Speaker pin! You can obtain the Speaker pin at the Pet Shop! The Club Penguin Speaker Pin is very coincidental! I think it is very crazy how it is located in the Puffle Shop, and it is a speaker from the Night Club. Hmm…. There is a new post on the Club Penguin blog about puffles! It was a reviewed by you, from a big Club Penguin fan! Last week Club Penguin asked how you’d been able to help others in need, and the staff was really proud of all the responses the community gave. Sounds great, Bubishii! You must be a really great Puffle owner! On the other hand, why are there so much events going on with puffles? What’s new posts, Upcoming Events 2010, Puffle Catalog, and much more! What do you think is going on with puffles around the island? The refrence in mission ten? This week’s newspaper is awesome! It talks a lot about the new playing coming to Club Penguin called, “Secrets Of The Bamboo Forest.” Overall, it comes with great info about the Cave Expedition and much more! Let’s start reading. February 5th, New Penguin Style Catalog! February 11th, New Pin Coming To Club Penguin! February 12th, New Puffle Furniture! February 12th, “Secrets Of The Bamboo Forest” Arrives At The Stage! I am looking forward to these upcoming events! I am interested to see how the “Secrets Of The Bamboo Forest” goes. I think it will be very spooky/cool! What did you think about the Club Penguin Times Newspaper Issue #224? Some weeks ago we noticed there was something going on the mine right? Well now it is done! Woah, this new rooms are pretty cool! If you don’t know how they look like, I will tell you what you will find on every single room and a picture of the room. Here you can also throw snowballs to the Power Machine to turn the lights on! This room is pretty creative. I love the way you need to find the pieces from the jewel. I like the Idea but it is for members only so non-members and former members are out of luck. “Rock” The Mine This Friday! 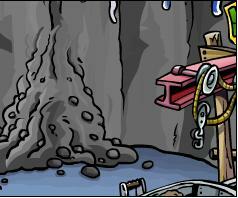 Looks like one of Gary’s invention but did he build this or did a certain bear do this…oh a yeti?! The party is coming this friday. Major events happen when i am not a member anymore so if there is a member area i’ll have to find a source for the pictures unless i can buy membership this week. What does this mean? Anyways, If you click on the big rock on the top a cave opening will appear. Thanks for Agentgtg who told me about this at school. Today Club Penguin released a brand new Better Igloos catalog for members. Here are all of the Club Penguin Cheats for it. 1. Go to the 1st page of the catalog. 2. Click on the middle stone on the Stone Lamp. 1. Go to the 2nd page of the catalog. 2. Click on the middle/lower part of the skis on the Ski Rack. 1. Go to the 3rd page of the catalog. 2. Click the bird on top of the Santa Hat Snowman. 2. Click on the red ribbon on the Christmas Wreath. 2. Click the star on the Large Christmas Tree. 1. Go to the 4th page of the catalog. 2. Click on the cushion part of the Modern Chair. 2. Click on the right piece of the broken ship. 2. Click on the inner right leg of the Coffee Table. 1. Go to the 5th page of the catalog. 2. Click on the right side of the Snow Tower. 2. Click on the top part of the Snow Fortress Wall. It is kinda not fair (wrong grammar i know) The day after my membership runs out they release cool items…what is up with that?! Rockslide in the Mine!, The Return of a Play! and a furniture Sneak Peek!